London Broncos will continue to play their home games at The Stoop in 2013. The club have agreed to extend their groundshare with rugby union side Harlequins FC. 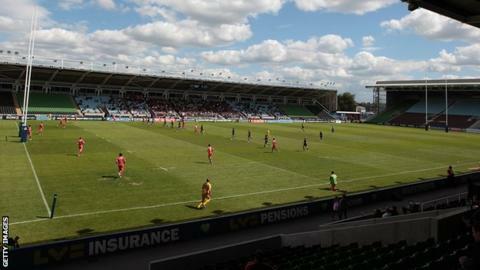 The Super League side played two games away from the Twickenham venue this year and had considered moving away from their south-west London base. The Broncos have announced they will play two more games on the road in 2013, with venues for those matches to be announced at a later date. Chief executive Gus Mackay said: "After lengthy negotiations and discussions we have decided to remain at The Stoop for another year. "The success of last season's on-the-road games has given us the opportunity to continue with this concept in 2013." The Broncos, who have been playing at The Stoop since 2006, played one game at Leyton Orient's Brisbane Road and one game at Gillingham's Priestfield Stadium this season.